Maruti Suzuki Ciaz recently went through a facelift in August 2018 in India. This mid-sized sedan has consistently shown record sales, making it the best-selling car from the Maruti Suzuki stables. 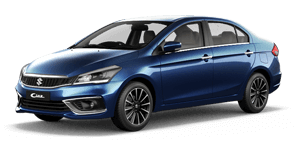 Maruti Suzuki Ciaz Facelift has upgraded features, to keep it ahead of other popular sedans in the highly competitive segment. Maruti Suzuki Ciaz facelift has it all, from a powerful K15 engine with Progressive Next Generation Smart Hybrid technology to plush, expansive interiors & the NEXA seal of safety. Before we explore the Ciaz facelift, let’s go back in the history of the car, to know more about this iconic Maruti Suzuki best-seller. Ciaz was launched in 2014, in the premium, mid-sized C-segment. 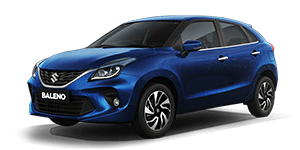 Until then, Maruti Suzuki was largely seen as a manufacturer of small cars with products catering to the needs of the Indian middle class. The Maruti Suzuki SX4, launched in 2007, beautifully made car with Powerful engine & was available in petrol & diesel. In order to match the expectation & demand of customers, the company decided to ease out the SX4, to make way for a premium C-segment sedan– the Maruti Suzuki Ciaz. Spaciousness, larger wheelbase at 4490 mm, more leg room, smoother and sleeker contours, class-best boot space, made the Ciaz attractive to the Indian consumer. Thus it quickly became a crowd-puller and firmly entrenched itself as one of the best Sedan. Also Read :WHY TEST DRIVE IS IMPORTANT ? Ciaz was initially sold through the traditional Maruti Suzuki CE channels across the country. Soon, they conceived the idea of a distribution network catering to the premium segment in cars. Thus, Nexa was born. The Ciaz, Maruti’s best-selling C-segment sedan was decided to be sold from Nexa outlets from 2017. The primary reason for this was to make it a win-win proposition for both, the Ciaz and Nexa. The new association was conceived as a symbiotic relationship, where both would benefit from the association. The Ciaz would attract more customers towards NEXA, and make the new entity as much of a success as the strong, conventional Maruti dealership network. 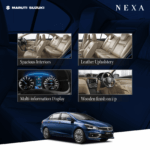 Likewise, since Maruti Suzuki conceived Nexa as an exclusive sales network for premium cars, the association would help improve the premium image of the Ciaz in the market. To make the transition smooth, the Ciaz underwent minor changes. Maruti Suzuki dropped the lettering and variant badges from the Ciaz facelift, only leaving the Ciaz nameplate, ‘S’ logo and the SHVS badge (for the diesel variant). An additional ‘Nexa Blue’ exterior colour option was made available for the Ciaz. 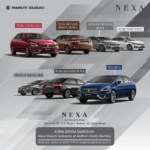 Other than the surface changes, the 2017 Maruti Ciaz implemented Nexa’s grade hierarchy: Sigma, Delta, Zeta and Alpha, instead of the original V (O), V+, Z, and Z+ grade hierarchy. The Ciaz RS became the Ciaz ‘S’ through Nexa. The Maruti Suzuki Ciaz was one of the first mid-sized sedans in the country to boast advanced automotive variants such as AMT and Smart Hybrid Technology. 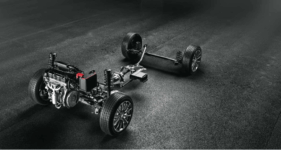 Suzuki Hybrid Vehicle System (SHVS) featured fuel-efficient technology like power assist, idle engine start-stop, brake energy regeneration and gear-shift indicator, along with an efficient lithium-ion battery. It helped the new Ciaz give an incredible 28 kmpl, making it one of the most fuel efficient cars around. Likewise, Automatic Manual Transmission (AMT) gearbox was an advanced technology that gave higher fuel efficiency coupled with lower complexities and ease of driving. Both technologies gave the Ciaz a distinct edge in the competitive Indian car market. So, what’s different about the All New Ciaz 2018? The Maruti Suzuki Ciaz facelift has been launched with flourish and flare after a long wait. Fans of the car have been waiting with breathless anticipation for the launch. And we must say, the new Ciaz facelift doesn’t disappoint. On the features front, Maruti has equipped the new Ciaz facelift with all the advancements in the motoring world. The car will be available in Nexa’s standard four variants Sigma (base), Delta, Zeta and Alpha (top). A key change is the all-new 1.5-litre K15B engine replacing the 1.4-litre engine of the outgoing model. The new engine will give 105PS@6000rpm and 138Nm@4400rpm, a jump of 14PS and 8Nm over the older engine. The new engine in Ciaz facelift comes with the choice of a 5-speed manual or a 4-speed AT torque converter. The 1.3-litre DDiS engine still powers the diesel variants with 90PS of max power and 200Nm of peak torque. Other than that, Smart Hybrid technology and AMT(Automatic Transmission) continue to be available in the Ciaz facelift. The 2018 Ciaz offers Striking new grille, LED Projector Head lamps with DRL, LED Fog lamps and LED tail lamps. Bluetooth connectivity, all four power windows, keyless entry, rear parking sensors ABS, Brake energy regeneration, Torque assist function come as standard. For safety comes, dual airbags and ISOFIX child seat mounts. Climate control and cruise control is available from the Delta variant onwards. However, the 7-inch touchscreen SmartPlay infotainment system is available only in the Alpha variant. It also includes inbuilt navigation system and mirror link support for smartphone connectivity. The ESP and hill-hold assist is available with only the AT variants. The Alpha variant of the new Ciaz comes with a bigger tyre size of 195/55 R16. The new Ciaz facelift comes in 7 colours namely, NEXA Blue, Metallic Premium Silver, Metallic Magma Gray, Pearl Metallic Dignity Brown, Pearl Snow White, Pearl Sangria Red & Pearl Midnight Black. Bookings for the all new Ciaz facelift 2018 have already begun. Get in touch with us at Nexa Shivam Autozone for a Test Drive!